The range-topping Skoda Superb and Superb Estate have been upgraded with new technology and extra kit. New tech includes Care Connect with automatic emergency call as standard from Ambition trim upwards – regardless of the choice of infotainment system. The key feature of the Care Connect is the automatic emergency call, which is activated following an accident if a restraint system has been triggered. The vehicle establishes a voice and data connection to an emergency call centre and transmits all the necessary data. The emergency call can also be initiated manually via a button in the roof module. In addition, remote access to the vehicle is now possible via the Skoda Connect App. The smartphone can inform the driver, among other things, whether the windows and doors are closed or the lights are off. The parking position function shows the location of the vehicle, the "Honk & Flash" function makes it easier to find the car by activating the horn and hazard lights. Numerous functions can now be operated on the optimised infotainment systems, with the display of the Columbus navigation system now larger, from 8 to 9.2 inches and the Swing system from 5 to 6.5 inches. In addition, the glass design enhances the high-resolution displays. With the SmartLink+ system on board, the Skoda Superb now offers navigation, infotainment and communication apps from the mobile phone into the car and also provides vehicle data for the evaluation on the smartphone. The Skoda Park Distance Control system has been upgraded to include a Manoeuvre Assist function which now also detects obstacles in front of the vehicle. The system not only warns the driver with optical and acoustic signals but also brakes the vehicle automatically if necessary. 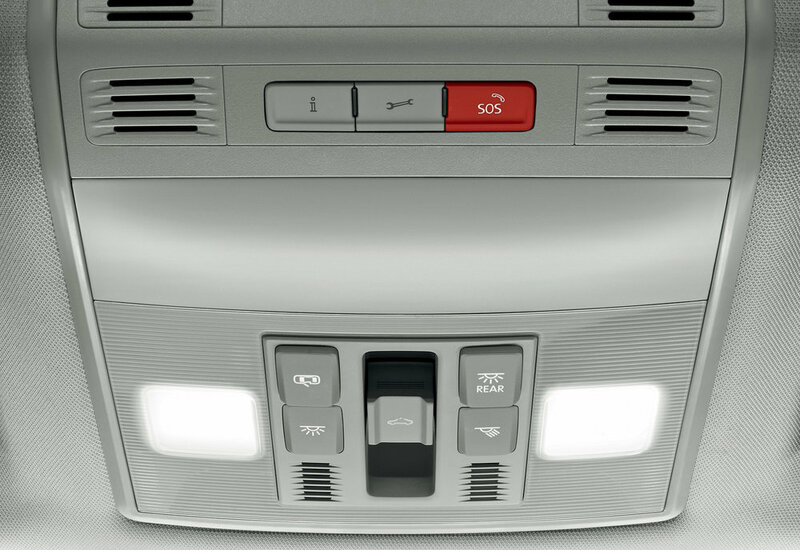 An optional massage function for the driver's seat, which is available with the electrically adjustable variant, has been added and includes ventilation and memory function. Also the communication among occupants is improved with Digital Voice Enhancement, which transmits the driver's and front passenger's voice to the passengers in the rear via a microphone in the cockpit. Additional improvements also contribute to lower noise levels - the front side windows are newly available with an acoustic film between the two glass surfaces. The new design of the 19-inch light-alloy Acamar rims underscores the elegant appearance of the top model. In addition, the revised Skoda Superb can be ordered later this year in a new ‘elegant’ car body metallic colour Velvet Red.